Using my scant photoshop skills (I am SO bad at Photoshop, still!) and scanned images of my paintings, I built composite designs which a local printer inked onto canvas for me. I stretched the canvases (as I recall they were about 18" x 24", not terribly large), and then went back into them with teeny tiny brushes, repainting the whole surface. ** It wasn't a standard paint-by-numbers sort of pass - as I reworked things, I changed out the background on some of the paintings, modified dogs to better match breed standards, added different accents of color, changed the value patterns from one portrait to another, and created a sense of cohesiveness to the individual portraits which now had to read as one whole image. And then I submitted photographs of the final pieces and tried to forget about it altogether. 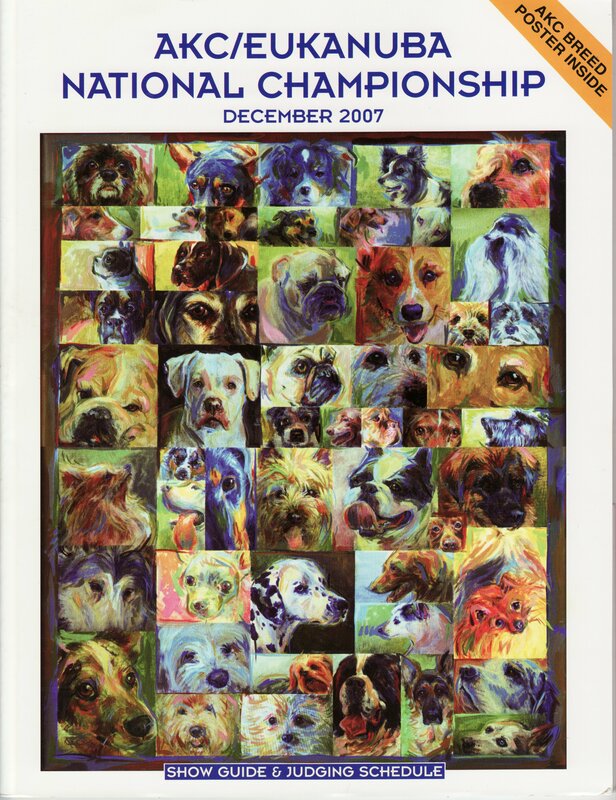 A few months later I was delighted to learn the AKC had chosen one of my designs, "52 Faces," pictured above. My artwork graced the program cover and posters benefitting the nonprofit Take The Lead were printed. They flew me (and my sister in law) to California to attend the dog show. I met so many wonderful people and their dogs, connected with some DogaDay fans, signed posters till my fingers cramped, took an absurd number of reference photos, and was delighted to welcome several board members as collectors. Having my artwork represent an organization as historied as the American Kennel Club is a tremendous honor. It opened up a number of opportunities for me to continue to do what I love - paint dogs. Before I sign off, though, I need to address the idea of "paint overs", for lack of a better term. "Paint overs" are when an artist paints directly over their reference, like what I did here. Said reference is commonly a photograph which the artist transforms into what appears to be an original painting. In my case, I was painting overtop a reference that was my original painting, taking artistic license during the re-paint to improve the composition. Regardless of how my artwork was described or presented, I was always truthful during the entry process and with everyone involved subsequently about it's evolution. It was never my intention to present the pieces I created for this contest as anything other than a compilation of my daily portraits, reworked to match the AKCs concept. At the time of this honor, I got some feedback from other artists that I misrepresented my process, and I certainly do not wish to open that Pandora's Box again!